Lloyd Dwight Coates, my uncle, was born on a Missouri Ozarks farm in 1921. He grew up working hard and soon after the war began he enlisted. Infantry training included pulling wagons full of rocks through the mud at Camp Polk in Louisiana and over the mountain trails at Camp Carson in Colorado. He entered the European Theater of Operations as a replacement for the 9th Infantry Division about two weeks after D-Day. Such was the pace of battle engaged by the 9th Infantry Division, “ The Old Reliables”. Equally remarkable is the story of the sniper. On a trail someone spotted a sniper and suddenly alerted the column. At that moment PFC Coates bent forward at the waist and ran like lightning, hearing the sniper’s bullet make the loud cracking noise as it passed overhead. His buddy, Leonard Karyews, immediately ran forward to the exact spot where Lloyd had been and emptied his M-1 Garand rifle into the sniper’s position. This is the way that the war was won, individual acts of bravery performed on a daily basis by American soldiers – infantrymen. Many others provide support to an army but the men on the ground with weapons in hand have always been the ones who get the job done. The Hurtgen Forest was not remembered very well at all. Perhaps it was altogether too tragic an event to want to remember. It was only related that the Germans were very accurate with their 88 millimeter cannons and that every time the GI’s got up and moved the artillery was soon upon them, and he commented that the shells blew up at treetop level. The only other comment about the battle – “It was really rough”. Soon after that battle was the beginning of the Ardennes Offensive, the Battle of the Bulge. Elements of the 9th Infantry Division were loaded into trucks and quickly driven approximately 100 miles to the rear. “We had to fight through that same 100 miles all over again”, my uncle told me and then just chuckled. 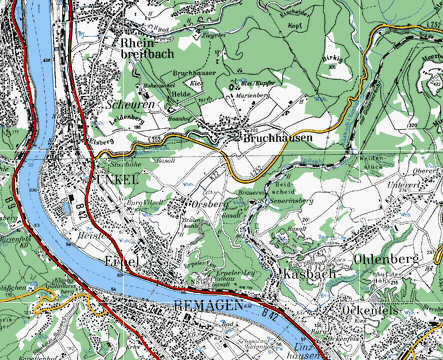 At Remagen, I Company was “the first to arrive at the bridge”. Certainly my uncle meant the first of his battalion, or regiment. “We had to cross the bridge one at a time. You had to wait until the man ahead was all the way across, then you could go”. Later I learned from my father that when he heard the story from my uncle one other comment was made, “The bridge was covered with blood”. The infantrymen of the 9th Infantry Division continued on their course. “We walked, by gosh, all the way from France to forty miles this side of Berlin and met the Russians there”, was my uncle’s summation of the American infantry in Europe in World War II. Lloyd was with the 39th Infantry Regiment all the way to the war’s end. He then served about six more months in the occupation force until mustering out and returning home near the end of 1945. He became successful as a cattle and hog farmer and also grew a garden and supported himself solely from his own land. He lived the remainder of his days alone on his small farm and then passed away peacefully one afternoon during a nap in the very hot summer of 1987, at the age of 66. The following are letters written to me by veterans of the 9th Infantry Division during the Fall of 2004. Please also read Steve's poem The Lord Taketh dedicated to his uncle. I joined the 9th Division - 39th Reg., 3rd battalion, K company on Oct. 5, 1944 in the Huertgen Forest. On Oct. 6, 1944 in the late afternoon, I was wounded in action and returned to the forest on 12/25/44, not too far from where I was on Oct. 6. It was quiet on Christmas Day and some of my buddies were teasing me about going on leave after 1 day in combat. It took me a few days to realize that I was so close to the place where I got hit so I asked them just what the hell they were doing while I was gone. I heard no more about going on leave. The Battle for Huertgen lasted from September 1944 - to the beginning of February 45. We went from there to the Rhineland by foot, crossed the famous bridge at Remagen, helped take the Ruhr Valley, then central Germany, then met the Russians at the Elbe river at the war's end. Your uncle would be close by. I know how hungry most nephews and grandchildren are to get details and it is not likely that you would ever find anyone who would know your uncle personally. If you have questions I would try to answer them. There are many books written and are possibly available. I could help you with that. I have a list of names of many who served in the 39th, if you give me his full name I could send you a copy. It was nice to discover your e-mail at noon on Veterans Day. Thanks Steve: I remember the ride, too. The battalion was in the Rhineland not far from Düren and advancing through small villages when the Bulge began. We heard some vague rumors about a breakthrough and then suddenly we were loaded on trucks and drove, as your uncle said, a long way to near Camp Elsenborn on the German Belgian border where we became part of the northern shoulder of the Bulge from Dec 16 or 17 until the middle of January. I got wounded Jan. 1 and was in the hospital for about a month and by the time I got back to L Company they had advanced to the Urft River. I am not sure of the town he is speaking of. It could have been a couple of different places. I first joined the company on Oct. 13. The day before L Company had lost two platoons of men in an ambush in the Huertgen Forest. They were down to two meager platoons and one officer. We got withdrawn from the line and filed up with replacements and then spent a couple of weeks just holding the line around Germeter. Then we went to near Camp Elsenborn, the same spot we returned to in December and spent a week or two getting reconstituted and reorganized. It was mostly hills and pine trees, not even many villages. This year marks the 60th anniversary. Hardly seems that long ago though sometimes. Yep, we sure did cross the bridge one at a time. We were at Bonn on the Rhine one evening and the next morning we loaded on trucks and were driven to Remagen without any idea what was going on (not too unusual, I might add). We got off the trucks and started down into town in a column of ducks, two abreast, and before we knew what was happening we were on the bridge walking on the pedestrian walkways on either side. The center was covered with steel plates so vehicles could cross. We were over the bridge in a matter of minutes, took a right turn and went down the east bank of the river to Kasbach where we stayed for a night or maybe two. Then we marched back along the Rhine under the bridge (which was being shelled regularly) and on to Rheinbreitbach where we went up into the hills and gradually widened the bridgehead. Some days later the bridge collapsed but by that time the pontoon bridges were finished and we were on the way east into the Ruhr Pocket. There was still a week or two of hard fighting, but after that the war was over. Thankfully. I'll never forget the bridge. I know it has never been rebuilt and that there is a museum there. I went back once in 1969 and drove down the east side of the river. In any event, I Company was right in all this and later on in the bridgehead fighting I took a patrol eastward and managed to get all the way through the I Company perimeter before they decided to shoot at us. Luckily they didn't hit anyone and we got them to stop. Such is war. Thank you for the in-sight on your Uncle Lloyd. He does sound like he was one of us. Think back on his "stories", the way that he told them, they all had a "happy ending" of sorts. didn't they? From the way that you tell it, he felt that he was lucky being back with the mortars. But, I'll bet that he did not mention that once the mortars started dropping shells on the enemy; the enemy started searching for the mortar locations with their heavy artillery to shut down those mortars. Being "back with the mortars" as relatively SAFE is only a GI joke (among us Infantry Company troopers). After five or six rounds on the way, it was time to pack up and move to another location before "Mrs. 88" found you. Uncle Lloyd must have been in his early sixties when he passed on. He lived alone with not memories, more like "can't forgets" for those extra 42 years. I calculate that whatever he told you of his experiences over there was only the 'good times', the fun times, the easy days where we didn't catch hell. I'm not saying that every day was rough, but when they were they were not half-way. You had a real "Hero" in your Uncle Lloyd. I hope that you remember and honor him the way that he deserves to be honored. He lived thru a "nightmare" from a front row seat.